In a video-first world where 70% of marketers claim video generates more conversions than any other type of content, you know that you need to either begin your video marketing strategy, or scale it up even further. Maybe you want to start creating videos in-house for your brand, but you're not sure how to get started. There’s a lot of free information on the internet; an overflow of blogs, eBooks, videos, and podcasts that scream video production 101, video editing 102, and video marketing 103. If you’re anything like me, then you need a resource which teaches you everything about video, from level one to level infinity. You need proper courses that are created especially for beginners like you and answer all your burning (and, sometimes even silly) questions. Well, look no further. I’ve compiled a list of online video courses to help you through every part of the video creation, editing, and marketing process. You’ll become a video connoisseur in no time (or, within a couple of weeks). The best part is that they’re inexpensive too. Does video production process boggle your mind? Take this course ASAP. From which video equipment you should invest in, to lighting, composition shots and pre-production secrets, this course is a must-buy-RIGHT-NOW for video enthusiasts, especially beginners. Expert or intermediate level video creators might not find it valuable though as it starts from scratch. All three instructors bring their own unique experience, their amazing skill-set, and their video secrets to the table, which makes this course a one-of-a-kind for students. They cover every little thing that pertains to the video production process and constantly nag students to practice, practice and just practice. They have a plethora of practice exercises for everyone who’s willing to learn, as well. Once you complete this process, you can start creating epic, pro-level videos for your brand.You’ll know what approaches to take with different video types, what steps to take to create a video exactly as you’ve envisioned it, and how to use different video equipments skillfully. Are you a complete video editing newbie, afraid of the learning curve? One of the these 3 courses should be perfect for you. Does editing software like Adobe Premiere Pro terrify you? Then register for this course right away. Phil is an excellent teacher who encourages experimenting with different Adobe features and provides a hands-on learning experience. He teaches everything in an easy, layman-friendly, newbie-encouraging way. This course is specifically for people who might have dabbled in Adobe Premiere Pro a bit by themselves but are still beginners, and people who’re completely new to the world of editing but need to learn pro editing skills. Larry Jordan’s video production and editing knowledge is second to none. He’s a video connoisseur. Along with a plethora of free resources on his website, his YouTube channel and his newsletter, he also offers excellent paid video courses. One of the best ones is his video editing course on Apple Final Cut Pro. If you’re more of an Apple person, this course is for you. He teaches everything a video editor needs to know and explains the WHY behind all techniques. 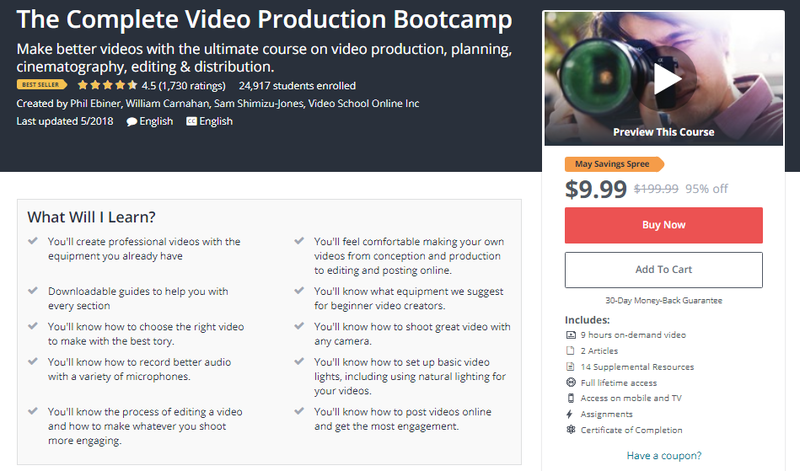 This course is perfect for beginner to intermediate level video enthusiasts. Apple’s Final Cut Pro too advanced for you? No problem. Practice your video editing skills on it’s younger sister, iMovie. 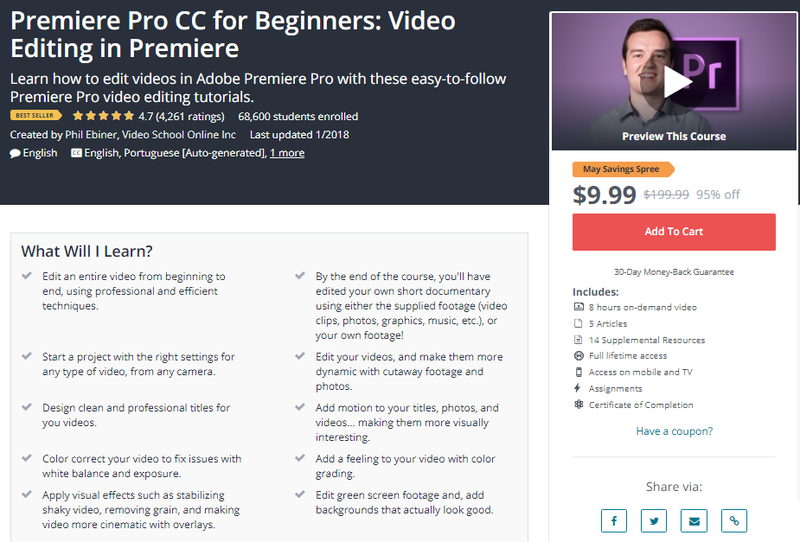 It’s an easier-to-learn-and-use video editing tool for Apple users. It’s a little on the basic side, so I’d recommend this to first time MAC users and beginner level video enthusiasts. You’ll become an iMovie pro in no time after taking this course from Rafi. He’s thorough, comprehensive and makes learning iMovie a breeze. The best part about him is that he also replies to your comments on Udemy and provides answers to your problems. You’ve done it all from shooting an A quality video to editing it like a pro, but how do you market it for maximum reach and conversions? Read on. Search Engine Optimization can be mind-boggling for people who’re new to the digital/video world. Optimum keywords? Long or short? If you don’t want to waste a whole lotta time understanding SEO and start implementing it quickly in your videos, HubSpot’s SEO course is the way to go. While this course is primarily for content (written content) marketing, a lot of similar rules apply for video marketing, as well. And it’s great for grasping the concept of SEO. The language is layman-free, the interface is simple and beginner friendly, and everything is converted from grassroots level. They’ve also got a thriving community where everyone is eager to help others. Another excellent course on SEO is Moz’s SEO training course. Want to learn everything about video marketing? This is an all-encompassing course on video marketing for video enthusiasts who have zero knowledge in marketing. From what objectives you should aim for to what metrics you should track, it has information on every little thing related to video marketing. Here’s what the students have to say about it. 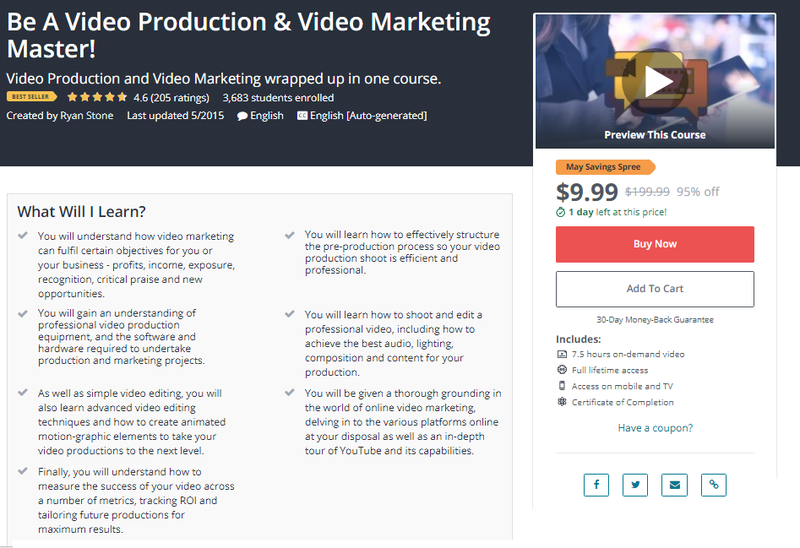 Suffice it to say, grab this course if you’re a video marketing newbie and would like to learn everything in a very short time! What are some of your favorite video courses that paid off? Let us know in the comments section below. We’re always looking to update our posts with the best information possible!